The oven is one hard-working device in your kitchen. It can bake, roast, heat, thaw, broil and so much more. The only thing being, all that hard work leaves a mark, especially on the insides of the oven. Wiping all the food gunk clean with countertop spray isn’t going to work – what you need is the best oven cleaner in town. How Does An Oven Cleaner Work? What makes the Astonish original oven and cookware cleaner different from the rest is the fact that while it is budget friendly and economical, it still does a great job. Cleaning an oven means you need the right formulation to take the gunk off without messing with the ceramic coating inside. This is where this product steps in. The Astonish original oven and cookware cleaner isn’t a spray, it comes in a paste. So firstly, there is no worry of overspray or overuse of the product. You just take a little amount on a cleaning sponge and start scrubbing the insides of the oven as well as the racks, since the product is metal safe. You can use as much or as little of this product as you require minus any wastage. Since it comes in a paste form, it’s also great for spot cleaning if your oven is otherwise clean overall. Frankly, if your oven really dirty, this may not be the product for you. But if you are in the good habit of tackling the insides of your oven as soon as it gets dirty, then the Astonish original oven and cookware cleaner maybe the best oven cleaner for you. It is also biodegradable, animal cruelty-free and vegetarian society approved. Plus it is non-toxic for the hands. So all those with a convection oven, sorry. This awesome product is not recommended by the manufacturer as it may discolor the insides of one. But for normal ones, this is a one-stop-shop wonder. Users often hail this product as the best one around, capable of cleaning ovens that have faced years of neglect. That’s the thing with oven cleaners – the great ones in the market can not only clean your oven to sparkle and shine levels but also extend its life. Food spills often harden and cake up the insides of an oven. You cannot vigorously scrub the oven to get it clean without taking off the protective coating. With the right product at hand, it becomes easy to remove those tough-to-remove stains and caked-up food, which then extends the life of an oven. The Easy Off Professional Fume Free Cleaner is one such product that can tackle both light stains and heavy spills, even if they have hardened and literally become part of your oven. The specialized formula breaks down the dried mess and loosens it without harming the inside walls of the oven, and then you can merely wipe the gunk away. It’s fume free and cleans up ovens, broilers and barbecue grills as well. It’s very easy to use. All you have to do is spray, wait and wipe away. And remember, food does taste better if cooked in a clean and mess-free oven. For spot cleaning, you just wait 30 seconds after a spray to wipe away. But for really dirty ovens, spray and keep for 40 minutes in a cold oven before wiping away. Despite the economic options and the all-rounder one above, sometimes the stains are just too tough for any old oven cleaner to handle. It is time to roll out the big guns, the heavy-duty best oven cleaner. Basically, if you are a hands-on cleanliness freak then all is well and good. But if you procrastinate long enough for the food mess to settle in and make the insides of your oven its home, you need something heavy duty. Like the Krud Kutter KK32 Cleaner, specially designed to get to the insides of s stubborn mess and effectively clean it up. Call it the last resort of the oven cleaners. It is the best oven cleaner there is to tackle heavy messes and spills in an oven that has seen a lot of cooking but little cleaning. Of course, the Krud Kutter KK32Cleaner isn’t just an oven cleaner, it’s also a great general degreaser and cleaner. It can be used as is or diluted to clean not-so-dirty surfaces. Greasy clothes, surfaces, utensils, window blinds as well as nasty gutters – the Krud Kutter’s ready-to-use super-concentrated formula can tackle any kind of dirt and grime. Food spills are the norm if you love your baking and roasts. The thing about these food spills is that you can mostly clean them only after the oven has cooled down to avoid any burns to yourself. So the spill does end to settle and become stubborn, and meld with the insides of the oven rather well. Paste cleaners and concentrated sprays are fine as one-off cleaners, but for normal everyday cleaning, you need an everyday spray. 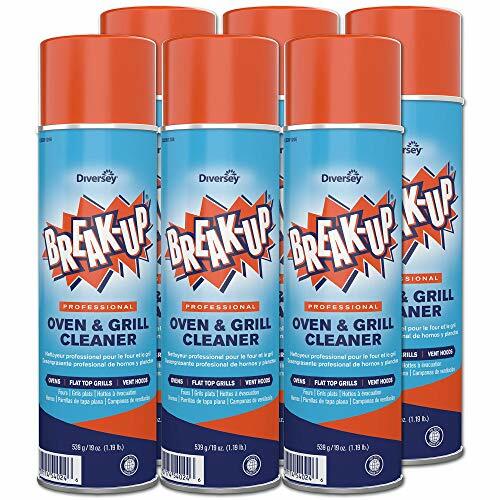 Enter the Diversey Break-Up Professional Oven & Grill Cleaner. An affordable spray cleaner that is CFC free and safe for the environment, and works like a charm on the insides of your oven. It can work on hot and cold surfaces, so you don’t have to wait for your oven to cool down completely. As long as it is cool enough to not cause any burns, you can get to work. It’s fume-free so you can use it to clean your oven where it is, though it is always a good idea to keep the kitchen well-ventilated whilst you clean. Need an oven cleaner that’s microwave and convection safe? The Carbonara Oven Cleaner is a fume-free gel that comes with a trigger spray for some really pointed application. This one is unlike a paste cleaner that you need to apply with hand. And not the same as a liquid spray that tends to be overused by a trigger-happy finger. The Carbona oven cleaner is a non-drippy gel that promptly gets to work as soon as you spray it on. What’s great about this oven cleaner is that it too is environmentally safe and biodegradable and stands certified for the same. While it is not particularly harsh on the skin, it is always a good idea to wear gloves whilst cleaning the oven with chemicals. However, it isn’t metal safe so using it on grills is not recommended by the manufacturer. To clean the grills, Carbona offers another product, the Carbona 2-In-1 Oven Rack And Grill Cleaner that comes equipped with cleaning fluid and a rack cleaning bag that you are supposed to soak the grill plates or racks in. Frankly, one good way to make sure your oven remains clean and fresh is to mop up any food spills and messes. Zs soon as the oven cools down to comfortable touch that is. The longer you leave the spills and stains inside, the messier the oven gets as the stains and spills become very tough to remove or clean. Scrubbing the insides with as scouring pad works on a conventional oven, but can harm the inside coatings in a microwave or a convection oven. So an oven cleaner that works for you is the best choice when the spills and stains get old and stubborn. Always wear gloves while cleaning up the oven after an application of even the best and safest oven cleaner. This will ensure no direct contact and keep the skin safe. Our skin is porous and can absorb chemicals from the things we touch – keeping it away from harsh abrasives will keep it, and us, protected. Always clean in a well-ventilated place. 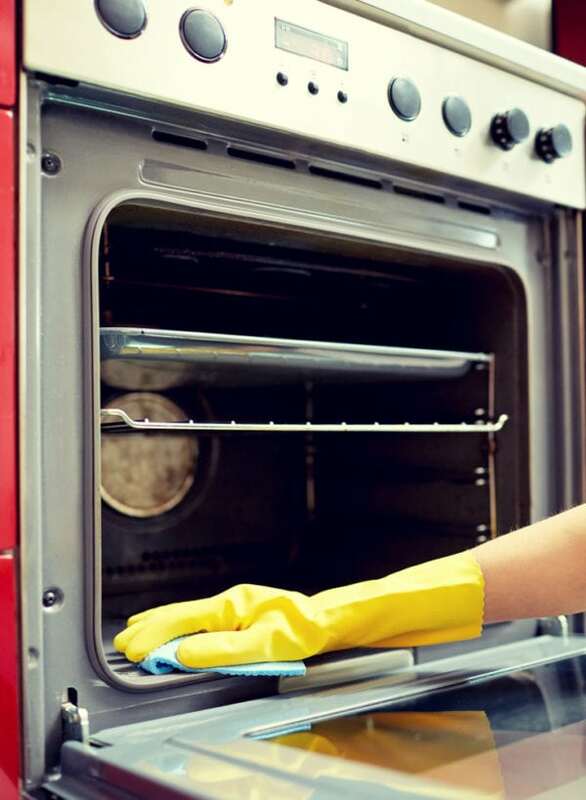 You don’t need to clean the oven outdoors considering it is impossible to lug it around, but you can make sure that the doors and windows of the kitchen are open. If you spot fumes or excessive acidic odors arising from the product you used, cover your face with a wet towel and quickly mop up the chemical. If you feel strange or sick afterward, you may want to consult a health care professional for oven cleaner poisoning. Remember to use mildly abrasive oven cleaners that are fume-free and environmentally safe. The best oven cleaner will be non-toxic to you or anything around. Choose the best oven cleaner that is non-toxic, bio-degradable, and environmentally safe as well as fume free. Reducing your carbon footprint becomes that much easy. In case you don’t mind using elbow grease instead, you can always try cleaning up the oven with baking soda and vinegar. The best oven cleaner will clean your appliance right. Some harsher and heavy-duty cleaners are not meant to be used on microwaves or convection ovens. Make sure you buy the best oven cleaner that suits your oven’s needs. Easy-Off: Easy-Off is a tried and trusted brand by Reckitt Benckiser, a British multinational giant formed in 1999 by the merger of a British and a Netherland company. Along with home products like cleaners, they also delve into hygiene and health products. Muscle: Mr. Muscle is the cleaning brand of SC Johnson, again a British multinational that has a presence in air care, home care, pest control, and home storage. Carbona: An American cleaning and stain removal product company, Carbona offers a whole range of cleaning solutions. It has stain removers, household cleaners, laundry cleaners and carpet cleaners under its umbrella. Krud Kutter: As the name suggests, Krud Kutter removes even the most stubborn of stains. This product from the 1921-formed US company Rust-Oleum has a slew of products perfect for any kind of cleaning. Astonish: Astonish Cleaners is a UK brand that started forty years ago by selling their oven cleaner door-to-door. Today this brand has a whole range of cleaning products – from cars to showers and of course, kitchens. Q: Should I use the oven cleaner on a hot oven? A: Most oven cleaners come with a set of instructions. If they are hot oven safe, most brands will specify so. But if they don’t, use them on a cold oven only. This will also reduce any risk of burns or injury to you as well. Ultimately, even the best oven cleaner is a chemical composition. Using it at high temperatures may end up doing more harm than good. Especially if it is meant to be used only on a cold oven. Some oven cleaners may instruct the user to heat the oven first. But unless specified, keep the cleaning restricted to a cold oven. Q: For how long should I leave the oven cleaner applied? A: Again, different brands and marques have different chemical compositions. Some are concentrated enough to do the trick in 30-60 seconds while some have to be left on for longer. Always check the pack for instructions. Do not leave the product on for longer than specified time or it can end up corroding the oven instead. Also, not all oven cleaners are metal safe so make sure you have read and understood the instructions completely. Q: I have a self-cleaning oven, so can I used the oven cleaner with the same function? A: Actually, most brands specify that oven cleaners should be used as is, not with the self-cleaning function. The self-cleaning function heats up the oven. It basically burns all food spills and particles into ash – making it easy for you to wipe off the ash once the oven has cooled. If you spray or apply on the oven cleaner and use the self-cleaning function, you are superheating a chemical that may turn volatile and end up damaging the oven. While you can use the oven cleaner that has a self-cleaning function, you should not use them both together. First, try and clean your oven the normal way with its self-cleaning functions. Once you wipe it down and still think it needs more cleaning, use an oven cleaner on a cool oven. Follow the pack instructions to a tee. So finally, which is the best oven cleaner around? Frankly, it is the one that suits your kitchen and cleaning needs the best. You can stick to a mild everyday oven cleaner like the Easy Off Professional Fume Free Cleaner for best results for a normal oven. 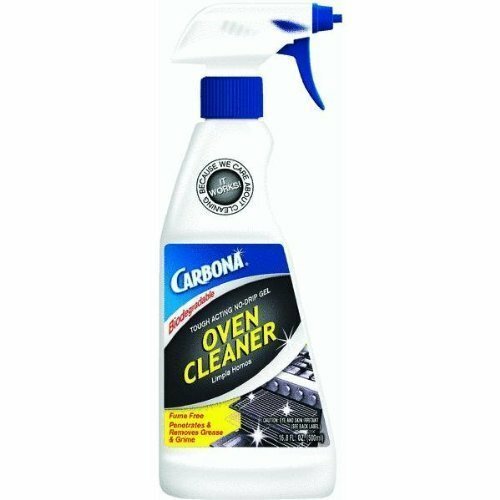 But if it’s a microwave or convection oven cleaner you need, then the Carbona Oven Cleaner might be the best oven cleaner for you. And if you are a stickler for cleanliness and keep your oven clean on an everyday basis, then perhaps the Astonish Original Oven and Cookware Cleaner might be the best oven cleaner for you. Choose the one that suits your cleaning style and your oven’s needs. And remember, while cleaning with chemicals, always be safe and take precautions as well.